TAGUIG CITY, METRO MANILA – There were no sharp words exchanged during the press conference for the IBF super flyweight title bout between defending champion McJoe Arroyo of Puerto Rico and Filipino challenger Jerwin Ancajas. 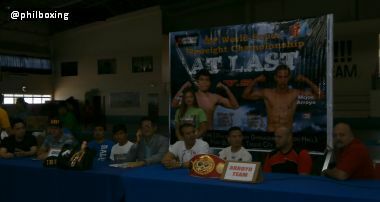 The protagonists spoke to the members of the media after their official weigh-in held Friday at the Jurado Hall of the Philippine Navy Gymnasium. Arroyo weighed 114lbs while Ancajas stepped on the scales at 115lbs. The unbeaten Arroyo (17-0,8KO’s) will carry the proud tradition of Puerto Rican boxing when he steps inside the ring. Puerto Rico boasts of a long line of champions like Carlos Ortiz, Wilfredo Gomez, Wilfred Benitez, Felix Trinidad and Miguel Cotto just to name a few. Arroyo, who won the vacant title last year by tenth round technical decision against another Filipino, Arthur Villanueva praised his former opponent. This title fight is appropriately billed “AT LAST” after postponements and a venue change cast doubt whether it will really happen. Both champion and challenger have stated that the postponements did not have any negative effect in their training. Ancajas (24W-1L-1D,16KO’s) will dedicate this fight to fellow Davao native and incumbent Philippine President Rodrigo Duterte. He feels that his determination to win in front of the home fans will propel him to victory. Sean Gibbons and Joe Ramos, who attended the presscon representing MP Promotions feel that Ancajas has a lot of upside being young and talented.Promoter Joven Jimenez thanked Sen. Manny Pacquiao for his support asked the Filipino fight fans to support this bout. The two southpaws will fight Saturday September 3 at the Philippine Navy Gymnasium (Jurado Hall) of the Philippine Marine Corps in Baranggay Fort Bonifacio, Taguig City, Metro Manila. This will be offered free to the public. Miller Alapormina (107) vs Alfredo Lacsina (104) – 6 rounds.